As the moon moves around the Earth in its monthly orbit, it often passes in front of background stars. Such events are called "lunar occultations" and one will happen Thursday at dawn in a Thanksgiving lunar treat. The path the moon follows varies a bit from month to month because its orbit is not exactly over the Earth's equator. Because of this, there is quite a long list of objects the moon can occult. This includes a number of bright stars, and, of course, all of the planets. Because the moon has no significant atmosphere, there will be no dimming of Aldebaran as its occulted: it simply winks out as if a switch was turned. The only exception is in a grazing occultation, when the moon just covers a star. Sometimes the star will peek out once or twice as it passes behind a valley right onthe edge of the moon. The exact time of the occultation will depend on your location. A planetarium program like Starry Night will give you the time for your location. These differences occur for two reasons. First, different parts of the country are on different time zones. More important is that the moon's location in the sky varies depending on your location because the moon is much closer to us than the stars or planets, so every location on Earth sees it from a different perspective. The background stars don't change, but the moon's position in front of them does. Don't feel you have to stay up late (or rise super early) to see a lunar occultation. 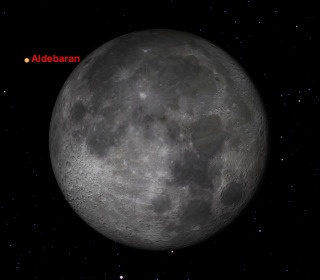 Aldebaran is located right in front of the Hyades star cluster, so that wherever you are and whatever time you look tonight, the chances are good that you will see one or more of the hundreds of stars in the Hyades being occulted by the moon. Editor's note: If you snap a great picture of the moon and Aldebaran, or any other night sky view, and would like to share it with Space.com and its news partners for a possible story or gallery, send images and comments to managing editor Tariq Malik at: spacephotos@space.com. This article was provided by Simulation Curriculum, the leader in space science curriculum solutions and the makers of Starry Night and SkySafari. Follow Starry Night on Twitter @StarryNightEdu. Follow us @Spacedotcom, Facebookand Google+. Original article on Space.com.